We have started another user questionnaire. We ran one 2 years ago - the answers were very helpful and definitely shaped the direction ZAP is now taking. So if you want your voice to be heard then please fill it in. Both OWASP and Mozilla will be applying to take part in Google Summer of Code this year. ZAP has greatly benefited from students taking part in this via both of these organizations, and we’re hoping at least one will be accepted so that we can take part again. If you have any suggestions for suitable projects or anything else to contribute then please join the discussion on the Dev group. New versions of the Active scan rules (beta) and SAML add-ons have been released - these include security fixes so if you use them then please update them asap. A new Community Scripts add-on has been released. This is a packaged version of the community-scripts repo (https://github.com/zaproxy/community-scripts) which is a collection of ZAP scripts that anyone can easily contribute to. Please contribute any scripts you create for your own use using pull requests! Also note that version 1 of this add-on contained a bug which can result in your ZAP configuration being lost, so if you downloaded that one then please update to the latest version asap. This section teaches you more about a different ZAP feature every month. Contexts are a way to group sets of related URLs together. You can use contexts to define the applications you are testing, as well as parts of those applications that you want to handle in non-default ways. Contexts allow you to define extra properties associated with those URLs so that ZAP can handle them more effectively. They are displayed at the top of the Sites and can be imported and exported using the buttons on the Sites toolbar. For this tutorial we will be using the BodgeIt Store, a simple vulnerable web application available from https://github.com/psiinon/bodgeit, but you can use any application that uses authentication. You need to access the target application before you can add it to a Context, so open the BodgeIt home page in your browser while proxying through ZAP. 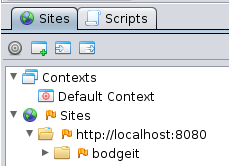 Find the BodgeIt top node in the Sites tree, right click it and 'Include in Context -> Default Context'. 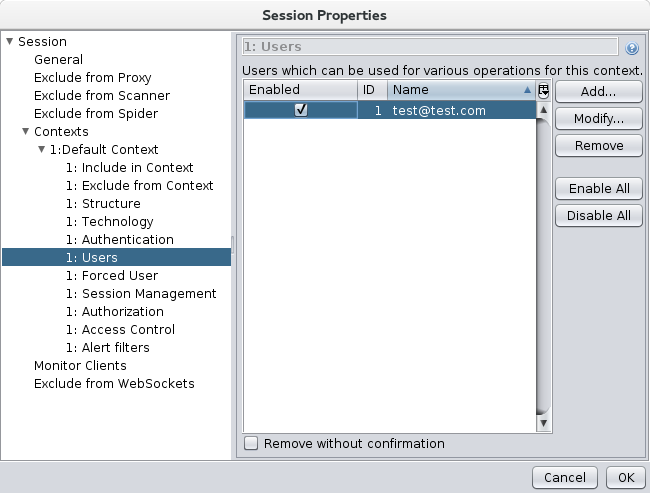 The Session Contexts Dialog will be displayed, which is part of the Session Properties dialog and is where you can define all of the properties associated with each context. The 'bodgeit' node and all of the nodes underneath it will now have been added to the 'Default Context'. Note that you can define as many contexts as you need. 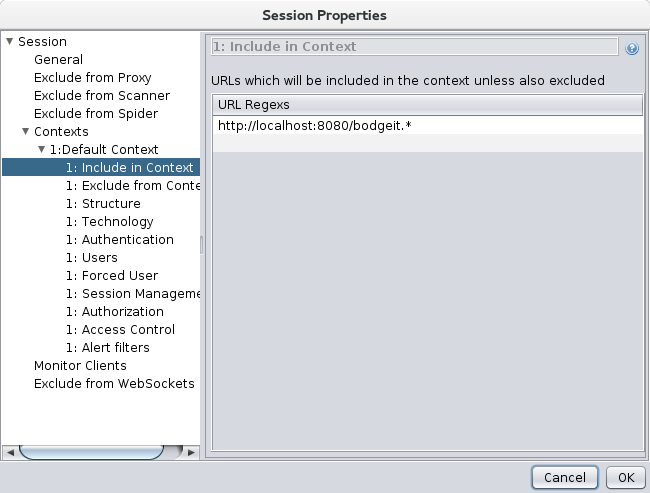 All details about a context are defined in the session properties. You can access these at any time by double clicking on the relevant context or by pressing the 'Session Properties' button on the main toolbar. The top page of each context allows you to specify the name and description. It also allows you to define if this context is 'in scope', ie they are part of the system that you are testing at any specific time. All nodes that are in scope are shown with a 'target' icon on them in the Sites tree. You can also switch Contexts in and out of scope by right clicking them in the Contexts tree. You can choose to spider or scan all of the contexts that are in scope with one command. You can also use the 'Protected mode' - this will only allow you to attack nodes that are in scope. Many of the ZAP tabs, including the Sites, History and Alert tabs have buttons which allow you to only display information that is in scope. The first 2 child pages allow you to define the URLs that are included in the context. This is done using regular expressions (regexes). The easiest way to include any leaf nodes and subtrees is to use the 'Include in Context' and 'Exclude from Context' right click options in the Sites and History tabs. However if you need to define more complex regexes then you will need to do this manually using theses screens. Always double check the nodes that are included by verifying that the target icons are set correctly. The Structure page allows you to define the properties that define the context structure. The Sites tree is ZAP’s representation of the structure of all of the sites you visit. It is very important that ZAP correctly understands the structure of the applications you are testing otherwise it will not be able to attack them correctly. then you should define those URLs to be part of a context and change the separators in this screen to ':' and ';'. For more details see the relevant section in the User Guide. This page allows you to specify the technologies used in the context, if known. By default all technologies are included. If you exclude technologies that you know are not used then this may speed up active scanning as rules specific to the excluded technologies can be skipped. This page allows you to manage the way authentication is handled for this context. Once you have defined the authentication and one or more valid users then you will be able to perform authenticated attacks on your target application, as well as perform more advanced testing of the applications access control. There are very few standards with regards to web application authentication, but ZAP is extremely flexible and so should be able to cope with any situation you come across. It can even cope with browser based single-sign-on systems like Personna. For this tutorial we will just handle the simple Form Based authentication that the BodgeIt store uses. A future tutorial will go into more depth on authentication. In the BodgeIt store register a new user. BodgeIt will automatically log this user in, so logout and login again as we want the login request and not the registration request. You will now be shown the Context Authentication page, which you will need to tweak. 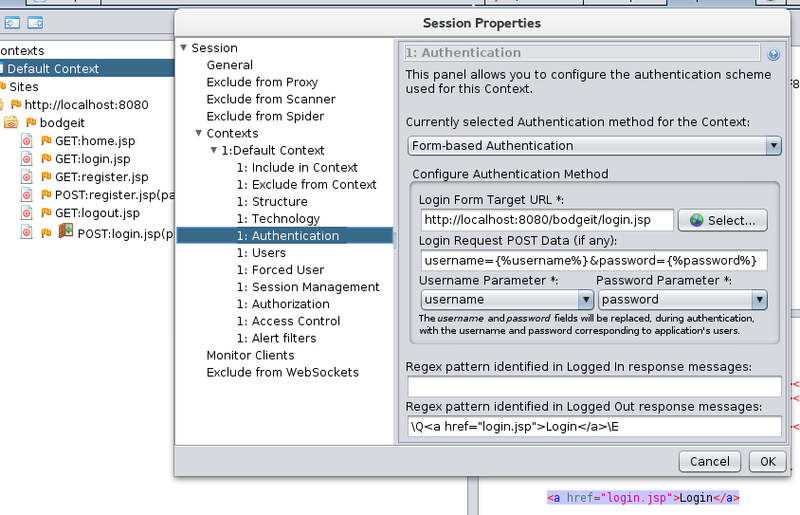 Right click the highlighted text and select "Flag as Context -> Default Context: Authentication Logged-out indicator"
You will now be shown the Context Authentication page again with the Logged-out regex pattern correctly defined. ZAP now understands how he BodgeIt authentication works, but it will need to know about at least one user before you can make use of this. You can configure that using the next screen. This page allows you to define as many users as you need for testing. If your application supports roles you should define at least one user for each role. You will need to fill in the correct authentication details for each user. ZAP will have automatically added the one used in the authentication request you specified, you just need to make sure it is enabled. The forced user mode allows you to force a specific user to be used for all requests that are generated by or proxied through ZAP. The forced user mode is switched on and off via an icon on the main toolbar. It will be disabled until all of the necessary configuration has been made. For this example select the user you previously registered with ZAP. Once you have saved the dialog you should see that the Forced User mode button is now enabled. Before enabling it make sure that you have logged out of BodgeIt. Then click the button to enable Forced User mode and click on one of the links in BodgeIt. You should see that you are now logged in - ZAP will have authenticated as that user in the background. If you are not authenticated then you will have made an error in your configuration. All of the authentication requests ZAP makes on your behalf will be shown in the History tab, so you can use those to help you resolve your issue. The Forced User mode is one of the simplest authentication tools but it is very useful for checking that you have configured the authentication correctly. Once you have checked that the forced user mode works you can now perform authenticated spidering and active scanning of your application. You can do this by keeping the forced user mode on, or by switching it off and then selecting the user you want to use in the Spider or Active Scan dialogs. This page allows you to manage the way in which Session Management is being done for the Context. After selecting the Session Management Method type, the options that need to be configured depend on the Session Management Method. For most applications you probably wont need to change anything on this page. This page allows you to define how unauthorised requests are handled by your application. This is used by the Access Control add-on which allows you to automatically test your applications access control. Faraday is an Integrated Multi-User Pentest Environment that’s principal goal is to map and leverage information you generate in real-time. Named after the British scientist Michael Faraday who was famous for his meticulous note taking (as well as the Faraday cage), our tool tries to emulate his rule of systematically recording everything. With more than 10 years in the industry, we have learned over here at Infobyte that pentesters and security teams have unique toolsets and skills. The idea isn’t to change a security professional’s workflow but to get everyone on one platform in real-time where information can be easily documented and used to gain greater insights for a security team. With 50+ supported tools Faraday is the connective tissue that brings together your different tools and team members to increase efficiency and analysis of your security engagements. The ZAP plugin recognizes information such as Hosts, Interfaces, Services, Vulnerabilities and send this to Faraday. With only a copy of a report, all this information is available in Faraday for all the members of your team. Open OWASP ZAP and start a attack, wait for the attack to finish. Save the report with any name. Open Faraday and copy that report to $HOME/.faraday/report/$WORKSPACE where $WORKSPACE is the active workspace name in Faraday. Here, you can see the “Tree Hosts” showing you information of a report of OWASP ZAP. 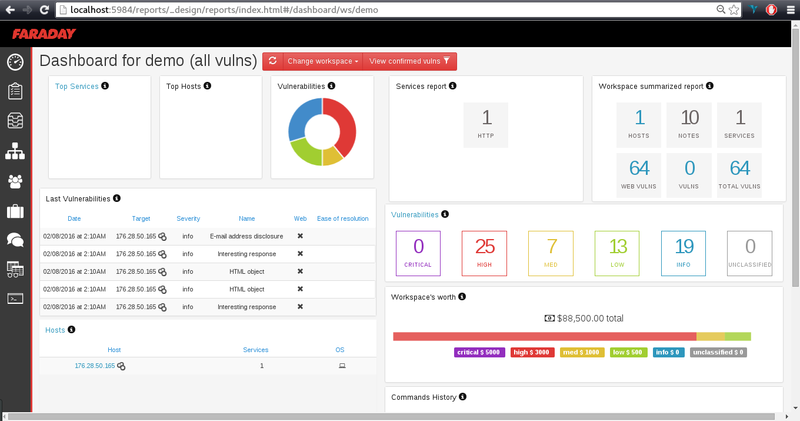 Hosts, interfaces, Services, Notes and how many vulnerabilities have been loaded. You can see more information about vulnerabilities found: Name, Description, Severity, References ( URLs, CVE and CWE), Path, and more. 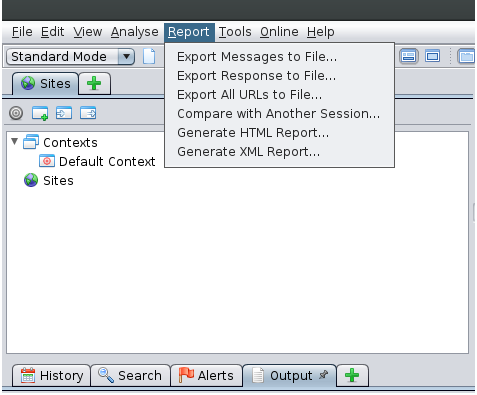 If you like web interfaces more than QT interface, Faraday has one! Here you can see the same information as in the QT interface , but you here you can work with the information. Group vulnerabilities by a field, show or not a field, show details about a vulnerability, edit or delete one, and download all the data such as CSV file. Also, Faraday greatly speeds up the time needed for a security engagement by simplifying vulnerability adjustments with severity classifications (CVSS standards supported). However, too much information can get confusing… Faraday has a dashboard with a summary of the active workspace for a more general overview of your project. Faraday comes in three flavors, a free community version that can be downloaded on our Github and a pro and enterprise version. In the Professional and Corporate editions you have role differentiation, different workspaces., workspace comparisons, tags, webshells, graphic customization (Corporate) and one-click report generation which typically has been the bane of security teams. We believe that awesome open-source tools don’t get the love they properly deserve and because of that we developed the Faraday awards, in which with your purchase of Faraday, you get to choose one open-source tool and we make a donation on your behalf to that tool It’s a way of giving back to an underappreciated community. 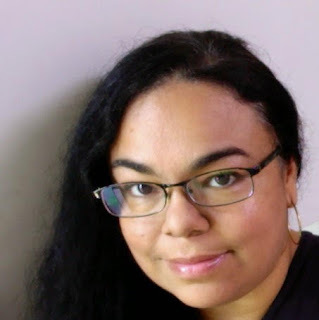 A: Johanna Curiel (aka @jctechno), Software & Security Engineer. A: I work as a programmer and pen tester part-time. At the moment I'm also working on cyber security research. A: Because I use it in my work. It's a tool with some wonderful features that work even better than many commercial tools in the same category. Also I have learned many things from using ZAP and understanding its programming core and architecture. A: Sporadically. Promoting it as pen testing tool, instruction videos, participating as mentor, working on documentation, testing and reporting issues. A: I have been working on an some add-ons, but I have not publicise them. I really would like to get more into creating add-ons and ZEST scripts and publicise them to the community. A: ZAP has great contributors, all working to help improve ZAP in different ways. It is amazing what a group of people can reach when they work towards a goal with the guidance of a great leader. A: Most important is that I use ZAP in my work. ZAP is for free and open source, with some incredible features that I use it in my pen testing and research. ZAP is the best free proxy available and by contributing you also give something back to help and keep ZAP developing and improving. ZAP has helped me understand security vulnerabilities much better. A: There are many ways you can contribute, whether promoting it, documentation, translating , coding, testing. Start with something small that you enjoy doing. Take your time to learn ZAP and find out where your skills can help best. A: Yes. I do contribute to other open source initiatives , specially those ones I would like to see grow and develop further. A: I live in the Caribbean so it's quite nice weather most of the time. I like windsurfing with my daughter , swimming, BBQ and traveling. A: I think ZAP is one of the easiest open source software to join development. There is a lot of documentation available to new developers wanting to get involved. I like the way the code has been structured and with the add-on concept it makes it even easier to experiment on your own, so I have nothing to dislike about. But as a developer if you think to be a serious contributor , you will need to invest some serious time to understand the code and start development, this is a quite common barrier to all new developer contributors. A: I would like to see more instruction videos or documentation on how to use ZAP with more complex features and writing ZEST scripts . There is a lot already published on youtube but ZAP has had an amazing development the last years that most of the videos are outdated. This is Zap newsletter is quite helpful. I have been using ZAP for a long time and looking forward the blog. I have one question not sure if you may also share your experiences. How to do ZAP fuzzing testing with Python API? I can do fuzzing testing with ZAP with no problem. Is there anyway I can do Fuzzing testing with API (Java or Python) so that it can be fully automated with CI without manually engagement? I refer to ZAP API. It seems there is no specific API for Fuzzing testing? i.e. I can define the parameters/payload by Java or Python. Thanks your sharing in advance.